I am usually leery of movies based on "true stories" of sensational events. They either tend to be voyeuristic and exploitative or overly sentimental puff pieces meant to paint a certain picture of the subject. I, Tonya is refreshing in that it is neither of these things. In fact it attempts to deconstruct both. I appreciated the way the film plays with the idea of what is "true" basically concluding that we won't know. The other thing to appreciate about I, Tonya is how it looks at the way socioeconomic class, gender, and patterns of abuse interplay. The Tonya Harding of this film is constricted by all of the above. America is implicated in the whole mess. I, Tonya does a good job of holding the mirror up to its audience and pointing out that we did this. We aren't just watching this, innocent in our comfy chairs. We are responsible. It's fascinating. Also fascinating is Robbie's performance. She graduated from up and coming star to full on movie star with her turn as Harley Quinn in Suicide Squad. Here she shows us that she is a real actor of the highest caliber with a performance which is intricate, entertaining, and pushes our boundaries. Her relationship with co-star Alison Janney is one of the most compelling of the year. Both actors shine here in award deserving turns. Neither is an easy role and often they are hard to watch. I, Tonya's subject isn't a comfortable one and forces us to see things we don't have to have to think about. I, Tonya manages to be both completely entertaining and fascinatingly exciting. 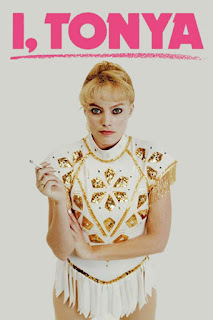 More focused on how we react to sensational stories than the actual story itself, I, Tonya saves itself from movie of the week blandness to be something truly interesting. It also gives two actors such great roles they can truly shine.